Originally created in 1924, Judson Bradway’s Bloomfield Village is an important historical community consisting of over 1,100 homes covering an area of one square mile from Quarton Road on the north to Maple Road on the south, and from Lasher Road on the west to the city of Birmingham on the east. 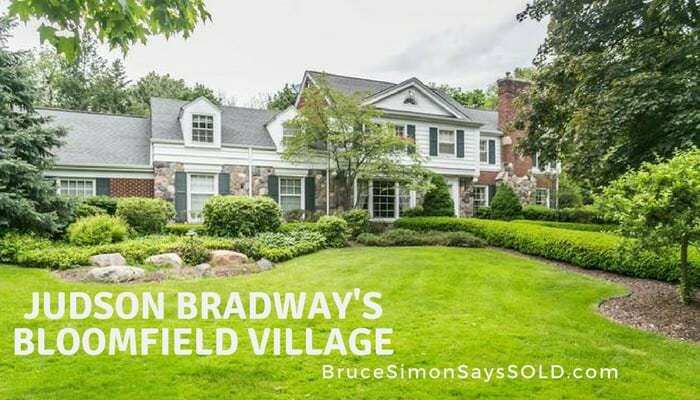 This Village is a non-political entity within Bloomfield Township and Judson Bradway maintained the community through 1966. Today, residents have formed the Bloomfield Village Protective Association and the Association was incorporated in 1942 as a nonprofit Michigan Corporation. All residents are automatically members of this association and are required to preserve the aesthetic and foundational quality of the community. Homes in Bloomfield Village feature large lots, mature landscaping, and are beautifully crafted to follow architectural guidelines. These traditional homes have rear entry garages, open lawns, mature landscaping, and two-story designs. Most homes were built between the 1930s and the 1960s. The Association board enforces aesthetics for a harmonious look and feel to the architecture. The Association is designed to maintain and enhance the character of the neighborhood and to ensure that the village remains a uniquely desirable community with stable property values. Because of this, most people that choose to live in Bloomfield Village do so for quite some time. The vision of the village is to create a residential community of the highest quality, and that is certainly what they have done. All homes are in harmony with each other and with their natural surroundings and settings. Most lots have open lawns and several plantings for privacy and to create a community of pleasant vistas, undisturbed by extraneous or incompatible structures that might detract from the natural, rural-like setting. Bloomfield Village hosts a number of clubs and social activities throughout the year. With several committees, garden club, a community network, and other activities, Bloomfield Village certainly is one of the most desirable and coveted communities throughout the township. The Village Knoll Shopping Center is located within Bloomfield Village and serves the needs of all community members with grocery stores, gas stations, restaurants, coffee shops and banks. The community maintains its own police and fire services. This is supported by residents paying an additional $600 annually in their winter taxes for separate public safety crews. The village operates with one full-time deputy fire chief and 17 volunteer firefighters. There are about five police officers patrolling the neighborhood that all times. Residents are part of the Birmingham public school district and Bloomfield Village is served by Quarton Elementary School, Derby Middle School, and Earnest W. Seaholm High School. These highly acclaimed schools are between one and two miles from the community. Just west of Bloomfield Village is the Oakland Hills Country Club golf course, the Plum Market, and several shops and restaurants on the intersection of Highway 24 and Maple Road. For more information on Bloomfield Village or any homes in Bloomfield Township, browse available listings on my website or contact me for a private tour today.